Faith-based NGOs are known to contribute substantial resources—financial, technical, human, and in-kind—to poverty alleviation, health care provision, and relief of suffering through international development activities and humanitarian assistance. It is critical to understand the necessary, complementary, and unique roles of public and private funding, the massive contribution of private resources secured through faith based entities, and the leveraging of public investment by private resources by those faith-based NGOs who receive public funding. Though quantifying these resources and their sources remains challenging, one publicly available source of data on revenues and expenditures is the US Internal Revenue Service (IRS) annual filings required of tax-exempt Non- Governmental Organizations (NGOs). This report is based on research that uses publicly available IRS 990 forms to quantify the private and public revenues and expenditures of US faith-based NGOs. A Special Event on the role of Religion & Humanitarian Action will be convened during the World Humanitarian Summit (WHS). The Special Event is being managed by the United Nations Inter-Agency Task Force on Engagement with Faith-based Organizations. An Advisory Body of Faith-based Organizations, including Partnership for Faith & Development’s Jean Duff, has been convened to provide additional guidance. A meeting of religious leaders and champions from 18 Eastern and Southern African countries gathered in early September to consider the potential impact of “Fast-Track: Ending the AIDS Epidemic by 2030″ in the region. With leadership from EAA participating organization, INERELA+, the conference issued a call to action, which is now open for expressions of support by other religious leaders, faith-based organizations, and advocates. The statement – text below – calls all sectors to be accountable for action and sufficient resourcing, and makes commitments particularly in the areas of testing, prevention, treatment within an affirmation of human dignity. We acknowledge that important strides have been made to address the HIV epidemic; there has been a significant reduction of new HIV infections in most countries; substantial increase in the numbers of people who know their HIV status; an increase in access to HIV treatment and in domestic financing for the HIV response. However, we are concerned that the region continues to bear a high HIV burden particularly among young girls and women. Key populations have not been fully integrated within our faith sector response. Sexual and gender based violence continue to affect families. Inequality persists in access to treatment especially for children. And too many people living with HIV continue to experience stigma and discrimination. We fully support the fast track targets and commit to advocate for robust action and sustained funding for the HIV response and actively participate in implementing targeted and effective programmes. We will partner with our governments to implement the fast track agenda. We will hold ourselves, our governments and development partners accountable to invest in expanded access to HIV testing and ART for all in need. We will mobilize our religious communities to take up voluntary HIV testing and help people stay on treatment. We will support through our health networks national efforts to scale up of HIV prevention and treatment services including SRHR services. We further commit to implement proven intervention in support to those who are HIV negative, comprehensive sexuality education and SRH services. We call upon all faith based organisations, religious and traditional leaders, civil society organisations, United Nation System, all government agencies and regional economic entities to implement the fast track agenda on HIV and AIDS in order to attain 90-90-90 targets by 2020. We believe that these are the necessary steps needed to create a transformative society, achieve zero new HIV infections and zero stigma and are essential for sustainability. Bristol, UK–Faith leaders have pledged far reaching practical action over the next 10 years to help the world’s poorest people at a meeting with senior UN officials in Bristol, UK, to discuss the new Sustainable Development Goals (SDGs). The action plans, called the Bristol Commitments, were presented to Paul Ladd, Director of the United Nations Development Programme’s Post-2015 Team, at the two-day Faith in the Future meeting, which finishes today. They include pledges to develop micro credit schemes for the poor, increase access to education, plant trees, invest in clean energy and green pilgrimage. The two-day Bristol UN Faiths Meeting, which finishes today, is co-hosted by the United Nations Development Programme (UNDP) and the UK-based Alliance of Religions and Conservation (ARC). Approximately 140 leaders from diverse international policy, religious, and faith-inspired groups convened at the “Religion & Sustainable Development: Building Partnerships to End Extreme Poverty” conference on July 7-9 at the World Bank Headquarters, beginning with an event on July 7 to launch the Lancet Series on Faith and Health. The conference facilitated a high level, action-oriented conversation about what works and what does not when it comes to engaging faith assets. The conference was co-hosted by the World Bank Group, the German Federal Ministry for Economic Cooperation and Development (BMZ), the United Kingdom Department for International Development (DFID), World Vision, GHR Foundation, and the United States Agency for International Development (USAID) in collaboration with the Joint Learning Initiative on Faith & Local Communities (JLIF&LC) and others. Jean Duff, President of the Partnership for Faith & Development, serves as Coordinator of the Joint Learning Initiative on Faith & Local Communities and assisted in coordinating the event. In attendance were senior international development policy makers, leaders of faith groups, academics, and other experts to focus on practical aspects of partnership between public sector and faith groups. In particular, leaders of the co-hosting agencies will be attending and speaking at the conference. The conference connected international development policy makers to knowledge, experience, research, methods and expert relationships to support more effective partnerships with religious and faith-inspired groups in the common cause of ending extreme poverty and promoting sustainable development. Specific recommendations for action to strengthen effective partnerships were developed through the conference process. Conference working sessions focused on Health Systems Strengthening, Humanitarian Assistance & Disaster Relief, Ebola & HIV, Sexual & Gender-based Violence, Religion and Politics, and Large Scale Engagement of FBOs for Development. From December 15-18 the international organization Brot fur die Welt, a Protestant Development Service geared towards empowering the poor and marginalized in more than 90 countries to improve their living conditions, hosted an International Consultation on Religion and Development in Berlin, Germany. The conference focused on the partnering and relevance of religion in development from a variety of perspectives, and discussing the interface between religion and development in civil society and governing bodies. International speakers presented on the effect of religion and development in relation to ever-important topics such as Environmental Sustainability, Peace and Conflict Solution, Gender, and Education. Collaborative efforts were made to create new proposals for concrete projects to advance the efficacy of religion’s role in development projects. Read more about the International Consultation on Religion and Development’s topics here. 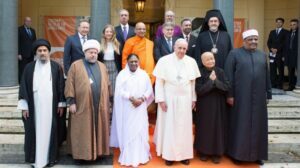 An unprecedented gathering of religious leaders from all corners of the globe took place in the Vatican last Tuesday for the signing of the Joint Declaration of Religious Leaders against Modern Slavery, pledging to eradicate modern slavery by 2020. The signing marks the beginning of a five-year push in churches, mosques, synagogues and temples across the world to send a message that slavery is forbidden by God – every God. Pope Francis joined Anglican, Orthodox, Jewish, Shia and Sunni Muslim, Hindu and Buddhist representatives in the Pontifical Academy of Sciences, together with two young trafficking victims from Mexico and Ghana. These faith leaders were brought together by the Global Freedom Network (GFN), a faith-based network with a vision and purpose to eradicate modern slavery and human trafficking globally. The Vatican launched GFN in March with signatories from Casina Pio IV, Lambeth Palace, Al Azhar Mosque and Walk Free Foundation. GFN has now invited religious leaders of all faiths and nations to add their names to this declaration. This gathering of religious leaders in the Vatican today represents around 90 percent of the world’s population and the declaration they signed commits their communities to working together for the freedom of all people and an end to this lucrative trade in human life. Listen to the discussion held at the Vatican at here, and read more about attendees and gathering here. Ecumenical Advocacy Alliance, The Global Network of People Living with AIDS, the International Network of People Living with or Affected by HIV and UNAIDs has launched a strategic initiative to strengthen collaboration between religious leaders and people living with HIV. This new Framework provides a way for systematic and sustained collaboration to boost the capacity of each stakeholder in responding to HIV, as well as forging or strengthening active partnerships for new and more effective approaches to treatment, prevention, care and support.